The crowd of the bee into which a Japanese bee divides gathers in the nearby tree etc.There is no problem if the crowd of this bee gathers in a low, suitable place. However, it is likely to gather in a tall tree and a distant tree actually. Therefore, the inducement board for a Japanese bee was produced. The number of Japanese bees increases and it divides. It becomes a situation in which it cannot live because it is narrow when honey and the bee become full in Japanese bee's house, and it increases any further. Then, the queen bee lays new queen candidate's egg in the special nest that is called a royal cell. The queen bee in old one takes worker bee's half the number along and says amount of bee from the nest ahead a little from come out by a new queen bee going out. This photograph is a bee inducement board to the extent that I produce it. It installed it from the horizontal in the height of about 2m at the angle of about 35 degrees. It might be a little more horizontally near. Bees do not gather in this board easily though bee's inducement board is made near bee 's house. The manufacturing method of bee inducement board is as follows. About one prepares the board of the tree of about 40cm by 5-10mm in thickness. It is what pastes a stainless net to the one side of this board and applies it. Surroundings of the net are fixed with 2-3cm width board. Moreover, to avoid rain on the opposite side of the net, the galvanized iron is pasted. Propolis is painted on the net. A stainless net is pasted and it applied because the surface of bee inducement board should be rough. It is from consideration that bee's bee's ball must not drop. Whats had divided before producing this bee inducement board still gathered from the ground on the tall tree by 10m or more. It was hard work though captured the bee with the capture net that a long bamboo previously put up though captured. If possible, it wishes bees to gather in this bee inducement board. 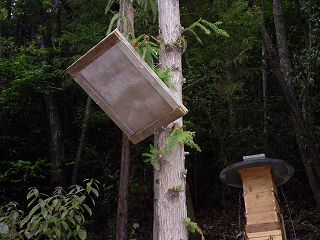 The material of bee's inducement board might use the skin of the Japan cedar and the bark of the cherry blossoms tree. There is a person who puts the one that the bamboo was divided, too. There is an user as it is an old plywood board, too.